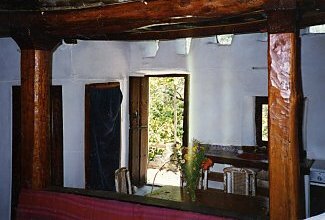 property description: a traditional and beautifully restored solar powered farmhouse on a sustainable organic smallholding, situated near Orgiva in the foothills of the Sierra Nevada. It is very secluded and private with the courtyard and dining patio festooned with jasmine and grape vines. It nestles beneath a rocky cliff on terraced land of fruit trees-ancient olive, almond, orange, lemon, avocado, cherry, loquat and fig-fresh fruit to pick all year round! 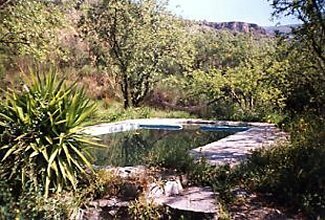 The natural swimming pool is refilled each week with fresh mountain water and is not chlorinated. Dining patio with barbecue, an idyllic place to star gaze enjoying a local wine. 9m x 4m natural swimming pool with enclosed shallow end-safe for small children. 2 sun chairs, 2 sun loungers, 1 hammock on the lawn by the pool. location: The land is a natural bird sanctuary, with species including Golden Oriols, Blue Rock Thrush and sweet singing Nightingales. There are many places to wander where one can find a shady nook, dream in a hammock or sit on the promontory and watch the world slip by down the valley below. The property utilises a compost loo with hand wash basin and a view! The acequia (irrigation channel) bubbles past and waters the land every Saturday night, including the organic vegetable garden and lily pond and refills the swimming pool with fresh mountain water - attracting a frog or two! Less than 1 mile away, a pleasant walk, is the market town of Orgiva which has supermarkets, banks, bars and restaurants and on Thursday there is a bustling street market. Further afield, Granada and the Alhambra Palace is 1 hour away and the beaches of the Costa Tropical 35 minutes. other details: Approximately 35 minutes to beaches at Salobrena / Motril on the Costa Tropical. 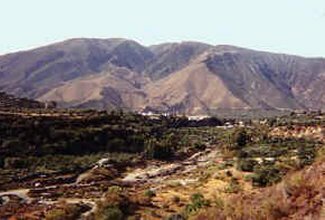 There is a bus service to / from the airports and to Granada and the mountain villages. Taxis to / from the airports can be arranged. 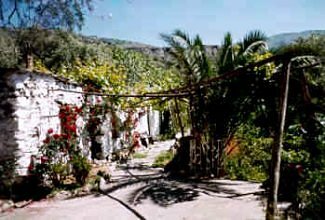 During the main holiday periods the Main House and Casita are rented together, sleeping a total of 4/6 people. Off peak periods the house or casita may be rented separately, but if 1 is booked the other will not be to ensure privacy. Both are complete independent units, however in colder periods the house is recommended as it has a wood burning stove. All linen except beach and pool towels provided. Solar electricity, 12 volt system.